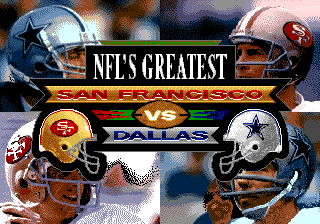 NFL's Greatest: San Francisco vs. Dallas 1978-1993 is a Sega Mega-CD "game". It is themed around American football, though rather than have the user play a game of it, you can merely watch highlights spanning fifteen years of the sport. Main article: NFL's Greatest: San Francisco vs. Dallas 1978-1993/Magazine articles.